More than 40,000 Ivorians crossed into Liberia in early 2011 because of political instability in Ivory Coast. Living conditions are difficult with some mud houses holding more than 20 people. 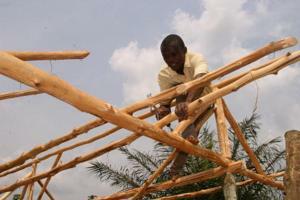 With the help of villagers, CRS is building shelters for the Ivorian refugees and will also support host families. What has caused the current clashes in Côte d’Ivoire? The outgoing president of Côte d’Ivoire, Laurent Gbagbo, has refused to hand over power to his rival Alassane Ouattara, who has been recognised internationally as the winner of the 2010 general election four months ago. The country is divided along ethnic, religious and economic lines. Mr Ouattara, from the north, appeared to have won last year’s election. But Mr Gbagbo’s supporters say that the vote was rigged. There are many interests at stake. Côte d’Ivoire’s cocoa industry means that it is a relatively wealthy country compared to its neighbours. Clashes between the two sides have grown increasingly violent in the last few weeks. The United Nations say that at least 440 people have been killed. How do the clashes affect the civil population? As violence is escalating in Côte d’Ivoire, many fear that the country could slip back into all out war. Around 500,000 Ivorians have already fled their homes to shelter elsewhere in the country or abroad, and at least 90,000 of them have taken refuge across the border in Liberia. Smaller numbers of Ivorians have travelled to Ghana and Guinea. If the situation in Côte d’Ivoire escalates, the number of displaced people is likely to increase rapidly. Côte d’Ivoire has a long history of coups, social unrests and violent clashes. A civil war between 2002 and 2004 caused massive population displacement with important implications for surrounding countries in the entire region. People in neighbouring Liberia, one of the poorest countries in the world, are already feeling the impact of the crisis. Most of the displaced people from Côte d’Ivoire there are staying with “host families” in villages. But with an estimated ten thousand people crossing the border every week, there is enormous pressure on already overstretched food and water supplies. The main needs are food and water, sanitation to prevent the spread of disease, and protection for children and vulnerable people. Families also need basic supplies, like blankets, mattresses and cooking utensils. It is also vital that more crops are planted to help communities cope with the influx of displaced people, and that latrines are built to prevent disease. Aid needs to be delivered now, as some roads are likely to be impassable during the upcoming rainy season. How is Caritas responding to the crisis? Through its national member Caritas Côte d’Ivoire and the support of several international member organisations, Caritas has been helping tens of thousands of people displaced by the clashes over the last months. Caritas is present in nearly all of the over 20 sites where displaced people have mainly gathered and is providing food and other much-needed aid such as household items, hygiene articles and protection. In and around the capital Abidjan alone, Caritas is helping more than 20,000 displaced people, most of them women and children. Caritas Internationalis launched an appeal for over €1 million to support the emergency response in Côte d’Ivoire. The different religious communities are currently providing shelter to roughly 25,000 displaced people. A lot of the aid from Caritas and partner organisations is also distributed through the local Caritas offices in parishes. Caritas staff are on the ground in Liberia as well. There, Caritas is providing food, seeds and other essentials, such as mattresses, blankets, pots and pans, as well as building latrines that will prevent the spread of disease. Projects protecting children and other vulnerable populations are also supported. What can I do for people in need in Côte d’Ivoire and Liberia? There are many ways you can get engaged and every contribution makes a difference. You can consider making a donation to support our emergency programmes on the ground. This way, you will allow us to bring urgently needed aid to thousands of displaced people in Côte d’Ivoire and Liberia. We also appreciate your spiritual support. Join us in prayer for peace in Côte d’Ivoire. You can download our prayer for Côte d’Ivoire and distribute it in your local parish. It is important to talk about the needs of displaced people in Côte d’Ivoire. With the recent events in Libya and Japan, Côte d’Ivoire has become a forgotten emergency so it is important to raise awareness about this major humanitarian crisis. Check out whether your country is adequately responding and consider joining lobbying groups or participating in campaigns or demonstrations in favor of peace in Côte d’Ivoire.